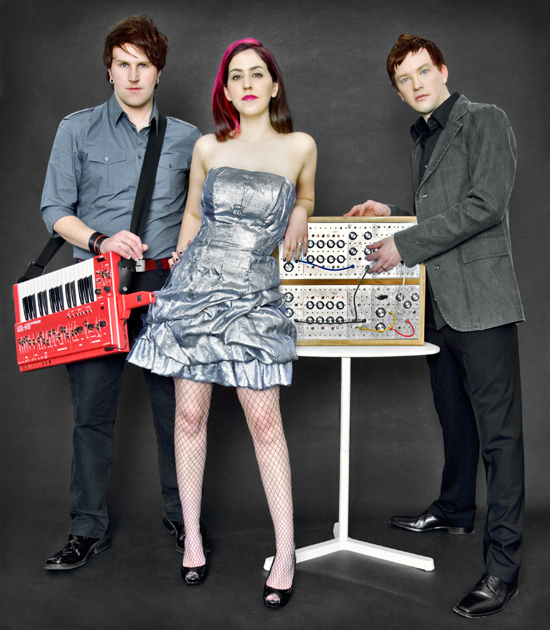 Freezepop is a Boston-based band who will be playing Dragon*Con on Saturday night (Sunday morning) at 1:30am in the Marriott Atrium Ballroom. Here’s their Dragon*Con profile. Freezepop does electropop. I’m just going to drop in their first paragraph from their Dragon*Con profile, because it explains things better than I can: “Freezepop has always been something of an oxymoron: embraced by both cool kids and nerds; serious about irony; and retro-futuristic. A synth band in a guitar videogame, singing pop songs about rock. And now their good and evil sides are on full view in a custom-built video player, a collaboration between the band members (who know a thing or two about making cool web stuff) and video director Michael Gill (whose other credits include Amanda Palmer and the Dropkick Murphys).” The band also describes itself as “”sweet and cold and fruity and plastic-y”. Sort of like an actual freezepop, get it? (Is the video game mentioned above happening at Dragon*Con? I have no idea). Oh God, guys, look at that keytar. They sort of have an 80s New Wave look about them, don’t they? So, how about we listen to some music? KEYTARS GUYS. THAT MUSIC VIDEO HAD KEYTARS. Everything is better with keytars. SO 80S. Wasn’t that amazing? I thought that was amazing. MORE MUSIC PLEASE. Shopping about 18 hours a day sounds about right. I think I might be falling in love with Freezepop y’all. Yesss I will so White People dance to the music guys. Freezepop is a total winner. TWO THUMBS WAAAAAAAY UP GUYS. LET US ALL GO TO THE FREEZEPOP PARTY. 1:30am on Saturday (Sunday morning) in the Marriott Atrium. Let us see if I can stay up that late!